The invasion of Alexander the Great in the fourth century B.C., arrested the decline of the Pharaoh’s power, providing a new leader for the government and even hope for the people. Alexander’s subjugation of Egypt was swift. After a short pause at the foot of the Sphinx at Giza, his invading armies went on to conquer Memphis and then turned north, looking for an oasis. Reaching the coast he discovered Pharos Island in the Bay of Alexandria, or Iskandariya, as it is called as Arabic. He connected the island to the mainland, creating a wonderful harbor, and made it his stronghold, establishing the town of Alexandria here in 331 B.C. 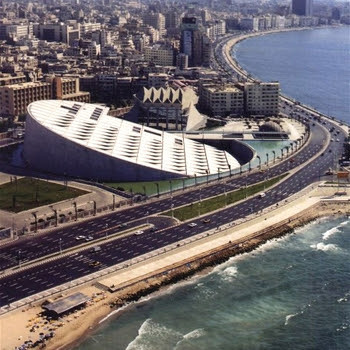 The journey from Cairo to Alexandria takes three hours by train and five by road. 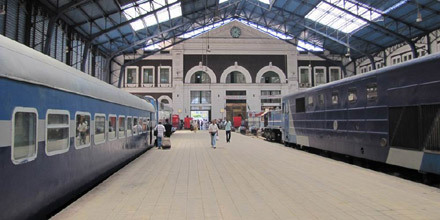 As one heads for Alexandria by train, just to the right of Cairo Central Station is a building that is frequently overlooked but shouldn’t be. This is the Railway Museum which contains fascinating information about the history of trains in Egypt. According to records in the museum, the first train ran from Alexandria to Cairo in 1852. Both the construction of the railroad and the production of the locomotives were handled by the Robert Stevenson Company, managed by the son of George Stevenson, inventor of the steam locomotive. Since the exhibits in the museum are not confined exclusively to the railroad, there is also much significant information on the history of transportation from the time of the Pharaohs, with interesting sketches depicting how thousands of laborers used logs and levers to move the great blocks of stone into place for the Great Pyramids. The trains now running between Cairo and Alexandria were produced in Hungary. The reclining seats in the “Deluxe” coaches are very restful. Meals are served to the passengers at their seats on aluminum trays. These air-conditioned cars are so comfortable that they are even slightly more pleasant than those of Japan’s “bullet train” which whizzes between Tokyo and Osaka. But because these carriages are comfortable does not mean that the startling cannot happen when riding one. During a trip I was making on this line, a waiter suddenly appeared and prostrated himself at my feet. Naturally, I was astonished but convinced that he wished some great favor of me. I was mistaken, however, for without saying a word the man placed his forehead on the floor of the carriage and began praying, turned towards Mecca, while the train hurtled forward to Alexandria. About fifteen miles out of Cairo, the train passes the Delta Barrage, the area known to Egyptians as Bath-el-Bakkarah “The Cow’s Stomach.” Here the Nile branches into the Rosetta and Damietta rivers. Although Napoleon was the first to think of constructing a barrage here to control the amount of water flowing into the two rivers, the actual construction work was begun by Mohammed Ali in the nineteenth century. Irrigation has created a fertile area with arable land stretching as far as the eye can see, broken only by the tall sails of feluccas as they glide along the numerous irrigation canals which crisscross the Delta. To eyes only used to the dry, light brown color of the desert, the green and blue of this area is superbly refreshing. President Sadat was born and raised on a farm in the Delta. He describes himself as having the “quiet personality of the Egyptian farmer, having been brought up on a farm.” He still maintains a country retreat in this area. Although irrigation has transformed the Delta into a rich agricultural land, most of the farmhouses are still made of brick and mud. Delta homes are still not fully supplied with the amenities of running water and electricity so most of the water is drawn by hand and light is usually provided by oil lamps. Families in rural areas tend to be large, and there is nothing extraordinary about a couple having six or seven children. Children are expected to work and are traditionally considered part of the labor force. The domestic animals oxen, donkeys, goats, ducks and chickens are treated as members of the family, so that a stay in an Egyptian farmhouse can result in being afflicted by fleas and all other manner of insects which plague domestic animals. There are a number of cotton fields and vineyards in the Delta. Most of the grapes produced here are used for Egypt’s flourishing wine industry. The domestic wines are often given such stirring names as “Ptolemy,” one of the kings who ruled Alexandria when the city was at the height of its prosperity; “Aphrodite,” the goddess of love; “Osiris,” the god of the underworld; and “Omar Khayam,” the poet. Farmers in the Delta rise early and ride their donkeys into the fields. Despite the complex irrigation system of the barrage, farming here has remained unchanged for centuries. The implements, hoes and ploughs, are rather small and water is drawn from the irrigation ditches by oxen or donkeys slowly treading round and round the same path. Water required for cooking is carried from wells in pitchers balanced on the women’s heads so that the scene from a train window is almost like experiencing a huge time gap; the daily life of people during the time of the Pharaohs seems to have been revived. Families in rural communities are not wealthy. Although the country people exhibit a quiet personality and have a strong sense of fatalism, an ever-increasing number of them are moving to the towns in search of a better life. The same phenomenon is occurring all over the world. And as in other countries, making it to the city does not guarantee a magic improvement in the standard of living. Too frequently the opposite is true. In one of his short novels, The Scorpion, Abd al-Rahman al-Sharkawi, a famous Egyptian writer and native of the Delta, describes the tragedy of people in the rural communities. His hero, a young man called Hassan, leaves the Delta where he was born to live in Cairo. But life is no better in the big city and Hassan returns to his village and finds work catching scorpions. He is paid one piasta for every scorpion he catches. A catch of ten or more means he can buy meat or a shirt. He is doing well, better than ever before, but one day he is stung on the foot by one of the creatures he hunts. . .